Well, 2010 is here and the legislators got their well-deserved break and are now back in the Statehouse. The committee schedule this week is so long, I had no desire to print it for fear of quadrupling my carbon footprint. AICUO is not knee-deep in any legislation as of yet, so I wanted to take some time to post a Year-in-Review blog post just to recap. HB 1 - The state operating budget...what else can I say? This was the grand daddy of them all! It required us all to take a hit and tighten our belts quite a bit. However, the next budget, in 2011, may challenge this one for the title of Most Difficult to Balance. HB 4 - Distance Learning Initiative. This bill will help to improve access to technology and advanced classes for all of Ohio’s high school students. This bill has been re-referred to the House Finance and Appropriations Committee, after passage out of the House Education Committee. HB 12 - This bill was a fun one to work on. The sponsor, Rep. Matt Lundy (D - Elyria), was very accepting of AICUO's ideas and issues with the bill as originally drafted. The bill now reflects the interest of all interested parties and didn't lose any of the "teeth" that Lundy was looking for. It has since passed the House and awaits a hearing in the Senate Finance and Financial Institutions Committee. HB 123 - STEM degrees are so "in" right now. Especially if you receive a STEM degree and stay in Ohio, you could receive a hefty income tax credit from this bill, if it were to move anywhere... This bill is a great proposal and it has AICUO's full support, but it just appears to be bad timing. The cost to implement this bill exceeds what legislators feel is appropriate. After the tenth fiscal year, the cost could exceed $183.2 million or more. HB 144 - Another tax credit bill that exceeds what legislators are looking to spend right now to retain educated, attractive-to-workforce students in Ohio. The bill allows any degree field to qualify for the credit, but graduates must stay in Ohio for minimum of five years. The bill sits in House Ways and Means Committee. 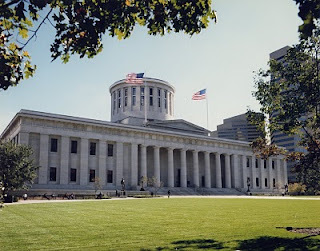 HJR 6 - This resolution would allow the General Assembly to approve the locations of Ohio's casinos as well as increase the amount of gross revenue percentages from the casinos that would come to the state. AICUO has met with the sponsor of this and is in support. In addition, the resolution requires that one-half of the proceeds of this tax be used solely for the support of elementary, secondary, vocational, and special education programs and one-half of the proceeds be used solely for assistance to students at certain institutions of higher education. Unfortunately, this resolution sits in House State Government Committee waiting for a hearing. HJR 12 - Implementation of the Third Frontier Program. From the public House website, it describes this resolution as such, "to permit the issuance of additional general obligation bonds to fund research and development." In English, that means the Third Frontier Program would be permitted to be on the ballot for more money than the last time it was authorized in 2002. AICUO and other higher education groups support this initiative and supports increasing the amount of money permitted to be distributed through the Third Frontier Program. SB 5 - Grants for Grads. Another initiative to retain graduates in Ohio, but this one made it through because it doesn't draw money from the General Revenue Fund and isn't going to be shelling out as much because the pool will be smaller than other bills. The bill will issue a grant to recent graduates interested in purchasing their first home. The money can be used for a downpayment or closing costs. Amounts are stair-stepped by degree received...$2,500 for associate, $5,000 for baccalaureate, and a whopping $10,000 for a post-graduate degree. The bill was rolled into the budget. For information, contact the Ohio Housing Finance Agency. SB 69 - Vaccination requirements for students living on-campus (meningitis and hepatitis B). The sponsor, Senator Gary Cates (R - West Chester), has been working with AICUO and other higher education groups to ensure that the cost of implementing this legislation wouldn't be a gigantic burden on their budgets. With recent cuts, colleges are fearful of any "unfunded mandates" placed upon them. Once the issue of cost is resolved, I assume the interested parties will continue to discuss the timing of the vaccinations and whether requiring them immediately before college is the most effective or if requiring them at an earlier age would be. It is currently sitting in the House Health Committee. SB 84 - The bill prohibits state institutions of higher education from renting or purchasing a bus that is not equipped with safety belts. Institutions may incur additional expenses to lease or purchase buses with safety belts. Three years after the bill's effective date, buses not equipped with safety belts can only be used for short shuttle trips. AICUO is skeptical, and only because campuses may incur additional expenses of approximately $20,000 per bus to retrofit owned buses with safety belts in order to use them for longer transit. This bill has only received two hearings in the Senate Transportation Committee. SB 198 - Another tax credit bill that didn't receive a timely release. The economy needs helps in Ohio and to do that we need to retain our graduates, good, educated, hard-working students. This bill and others like it are great ideas in a not-so-great time. The bill has received one hearing in the Senate Ways and Means Committee. Of these bills listed, I really think only two or three will be passed by both chambers if it hasn't been already. It has been one of the slowest, legislatively speaking, general assemblies ever. If I remember correctly there have been less than ten bills passed by both chambers and signed by the governor, I COULD be wrong on the number. As for issues that AICUO expects to work on in 2010, Third Frontier and the Capital Budget Bill lead the way. I might add the redistricting bill in that list as well. I just depends on if the two parties can come to some middle ground. Election reform has reared its head a couple of times as well, making it a crap shoot to guess at which piece of legislation will be 2010's baby. The Capital Budget will be an interesting issue to watch unfold, as there are limited resources available this time around. This legislation contains capital appropriations made for the construction, replacement, and improvement of state assets and facilities. Although our campuses cannot directly position themselves for dollars, they can work collaboratively with their local communities to obtain funds. If you need any further details on this legislation or its procedure, please contact us. So there you have it...the issues that AICUO has worked on in 2009. Some issues were worked harder than others, and a couple haven't seen the light of day, but could, and that is part of the fun.